My view is GCR theory is more related to explaining thousand year changes; however, I recognize others have extended it to try to account for most of recent warming. On the hand, I haven’t received any response to my #34 post about the reason the Ewing-Donn model fell into disfavor, aside from the sea depth issue. The thing that has somewhat mystified me about the glacial periods is: “Where did most of the snow/ice come from to form the glaciers?” Did it come from the warm tropics and temperate oceans as global temperatures fell? 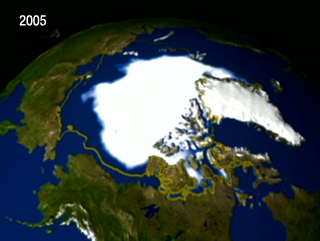 Ewing-Donn suggests it came from a relatively ice-free Arctic. Is there a model somebody has run with the Earth axial tilt changes cycling the Arctic from relatively warm, lesser ice periods leading to heavy snow in the higher latitudes with more ice, frozen, dry periods until the glacial maximum is reached? This seems to be the core part of the Ewing-Donn model. Or, is this simply not how it happened? What is the possibility that an ice-free Arctic Ocean will bring about ocean effect snows, capable of spawning very intense bands of precipitation, which deposit at a rate of many inches of snow per hour? If GCRs were responsible for recent warming, wouldn’t atmospheric temperatures by altitude have a different profile than for AGW? And if the atmosphere doesn’t exhibit that profile, isn’t that a big problem for GCR-induced warming? Are you referring to some of the studies showing El Nino like conditions during the last Ice Age? Reading the qualifications in your remarks, I’m guessing that the topic of the source of ice age glacial ice hasn’t been studied much either because everyone thinks they already know the answer or maybe because it is hard to study. I have always thought the Arctic Ocean to have been mostly covered with ice through most of the last Ice Age, only to begin breaking up with the Holocene. At the same time, I found it hard to understand how the temperate and tropical zones with reduced atmospheric and ocean temperatures during the Ice Age could evaporate enough water to drive enough snow far to the North to form the glacial ice. Hence, the mystery for me about glacial ice. I understand what you are commenting about. Scientific writing can be very technical and the writing style, apart from the technicalities, can be dense and convoluted. Legal writers have the same habits. Some in the legal community favor the “plain english movement”. Its where the writing is only technical as it needs to be and the writing is in a clearer and simpler writing style. The goal is to make legal literature more accessible to the general public. Liked Rasmus explanation ln #39, because it brings up a clear fact that the Polar long nights in darkness have a huge amount of lower latitude advection, primarily because vast areas of heat sources overwhelm the smaller much colder Polar zones. I must add that since the Arctic has been largely warmer now a days, it does create a lower latitudinal warming feedback of sorts. Heat from advection lasts longer in the Arctic, reducing the size of cold air mass formations considerably, making in effect the South of the Arctic largely warmer for much longer periods of time, reducing once upon a time long bitterly cold winters, to occasional irregular “weekend” winters largely dominated by fall like conditions. One can see quite often much smaller cold air masses struggling to linger, this is a sure sign that warmer air is taking over the Northern hemisphere at quite a remarkable pace. Very interesting! I recommend reading http://www.1ocean-1climate.com, where you can find more data on the Arctic-sea ice extent. I see very little information regarding the water cycle in the discussions. It seems that as global ocean temperatures rise and the water cycle increases the additional temperature transfer from surface to atmosphere would be very great – not to mention the extra convection. Again, it seems this would be a lagging but extremely powerful negative forcing. If there are specific links regarding this I would be very interested in learning more. I think any gain in cooling from evaporation would be countered by the increased greenhouse effect from having more water vapor in the air. Thank you Rasmus for your clarification, it helps me understand. I have been reading here for a year or so and just try to get what I can out the posts and comments. I appreciate anything you can do to help me understand what you are saying. And I also see why you would want to use the language you have developed to communicate with others in the field because by the length of your explanation it is obvious that posts could become incredibly long if you had to describe every detail in more public terms. Re “Very interesting! I recommend reading …” — I don’t think I’d recommend that site for anything beyond the owner’s belief that war caused the climate to change. It’s an opinion. In reply to 1): See figure 6 in the attached paper that shows there is close correlation between observed the global temperature anomalies, including the last 50 years, to the level and changes in the solar index “ak”. If the above data is accepted, there is smoking gun evidence that GCR flux changes AND solar changes could be responsible for a PORTION of the recent observed global temperature change (1950 to 2005) in addition to a portion of the temperature changes observed for the period 1900 to 1950. The question as to what are the likely climatic mechanisms which could have enable GCR and solar activity changes over the last 100 years, to have likely caused a PORTION of the observed temperature changes in the last 100 years, will be addressed in the next comment. This is a lot less impressive than it sounds. The coefficient of determination is the square of the correlation coefficient, so r = 0.35 means only 12% of the variance is accounted for. RE: # 57 – How do you account for what has been happening during the winters, in the mid latitude Western US, since, more or less, the late 1990s? That does not square with the mechanism you have described. Are Yukon and Alaskan cold air masses somehow exempted? RE: #66 – The data are from 22 Dec. There have been some (minor) changes in the sea ice pattern since then. Most notably, the Bering Sea ice edge has swiftly moved to the south southwest, and Hudson’s Bay has essentially completed its ice closure and will now remain ice bound until this summer’s melt ensues. One item of note – the necking of ice between Greenland and Iceland has been coming and going (changing with winds) – we might see closure there this season, especially if the pattern that was prevalent in October and November returns. I was not able to reproduce the corresponding part of figure 6 in the cited paper. Even if there is a trend for some part of the time period, there should be an overall trend since the 1950ies to explain the temperature increase since that time. The 1977-2006 mean (last 30 years) of the Ap index is the same (in fact a touch lower) as the 1935-1965 mean. Doesn’t that presume the mechanism, whatever it may be, acts with little or no time lag? There are so many possible correlations here — like the well established one between cosmic ray counts and murder and homicide rates — that it’s hard to figure out what’s connected to what and how. Suppose (speculating in the absence of any knowledge) that, say, the sun’s varying magnetic field exerts, say, a varying drag on the rotation of Earth’s core by interacting with Earth’s magnetic field — that might warm the planet, but the lag time for the heat to reach the surface would be considerable. Hank, of course you are right that there could be a time lag. But if there is one, it is highly probable that this time lag always exists because it is a charachteristic of the mechanisms. Thus you should find it in the data. This is the case e.g. for El Nino and global temperature, where there is a strong correlation and a time lag of about 5 months (that’s why we will see the effect of the current El Nino on global temperature mainly this year). However, I haven’t seen any evidence for a coherent time lag concerning any solar parameter, neither sun spots nor cosmic rays nor magnetic field etc, and neither on the short term nor on the long term. If there is a time lag of global temperature to changes in solar activity or the magnetic field of more than a few decades, this should be detectable in the time series since the Little Ice Age. However, there isn’t any. The proponents of the solar influence always present the ‘perfect’ match of solar parameters and temperature since the Little Ice Age, with supposed time lags of a few years. If there is no trend since 1950, and solar parameters should explain the recent temperature rise, there would have to be a time lag of at least 50 years. But if there is a time lag in the order of 50 years, we should see it in the data of the last few centuries somewhere, but we cannot see it. Of course theoretically there could be a time lag of a century or more so that we would see now the effects of the rise after 1700 or 1800. But you will have a hard time to find corresponding physical mechanisms and to find a forcing-reaction model which reproduces the temperature evolution of the last few centuries in that way. Maybe it is possible but there isn t any evidence, which makes it quite unlikely.